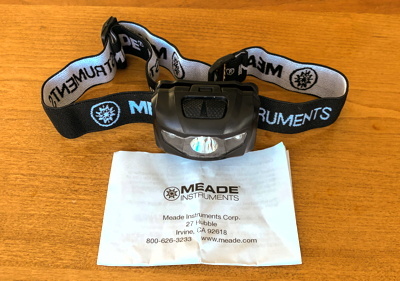 Meade sent me their new LED Headlamp. This Headlamp has a bright white LED and two red LEDs. It has an adjustable elastic strap and comes with 3 AAA batteries and instructions. 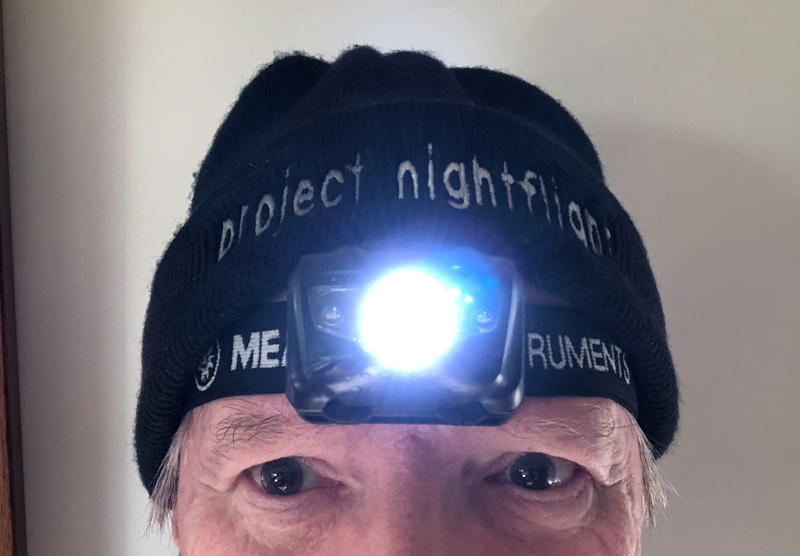 If you do not wear a cap at night then access the buttons on the Headlamp will be easy. 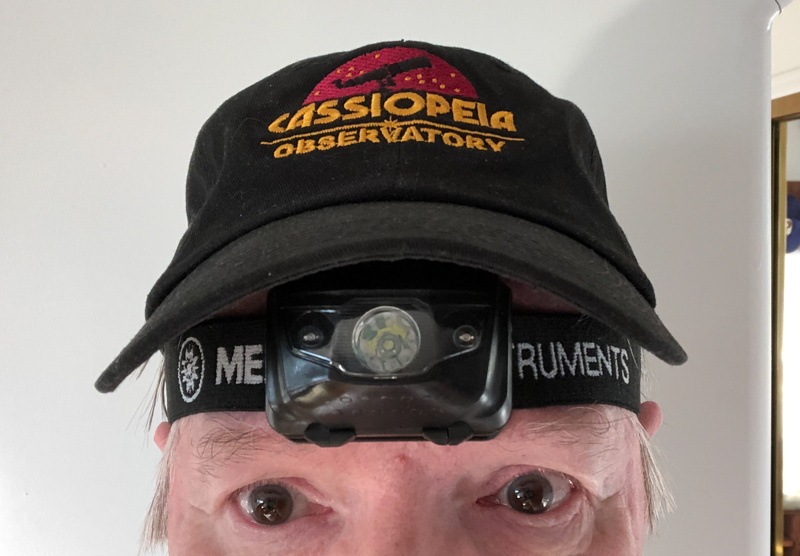 Wearing a billed cap (like I do on warmer nights) can prevent easy access to the buttons unless you wear the cap backwards (which I do when looking through an eyepiece) or tilt the cap back. Wearing a knit cap (as I do on winter nights) provides easy access to the buttons. 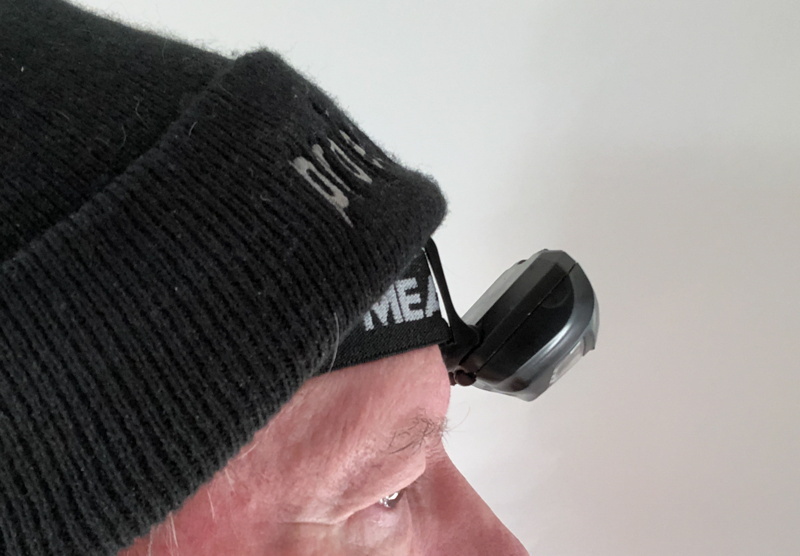 The Meade Headlamp is useful when you need to use both hands to do something, such as mounting a camera on a tripod, connecting wires, looking up something on a chart, and writing notes. I have frequently done these things with a red flashlight held in my mouth. The Headlamp avoids the need to do that. 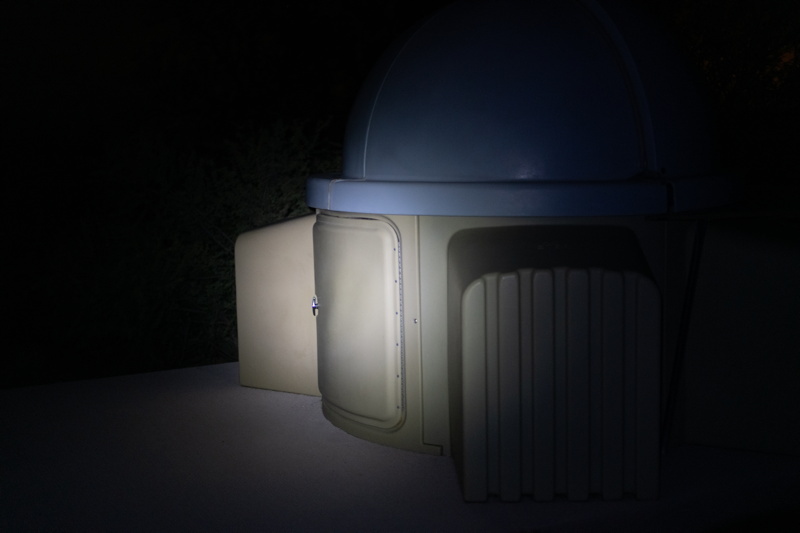 I used the Headlamp with the red LED frequently in my observatory and found it very handy. The buttons at the top of the Headlamp are large and easily used. Multiple presses cycle through on, dim (white only), flash, off. Both lights can be illuminated at the same time. Remembering that "Right is Red" helps to remind you to not press the wrong button at night. Using a large diameter eyepiece or placing your eye to a camera viewfinder will likely require the Headlamp to be high on your forehead. The only times I switched to using a handheld red flashlight was when a shadow from the Headlamp made something difficult to see. The red LED provides adequate illumination for walking at a dark site. 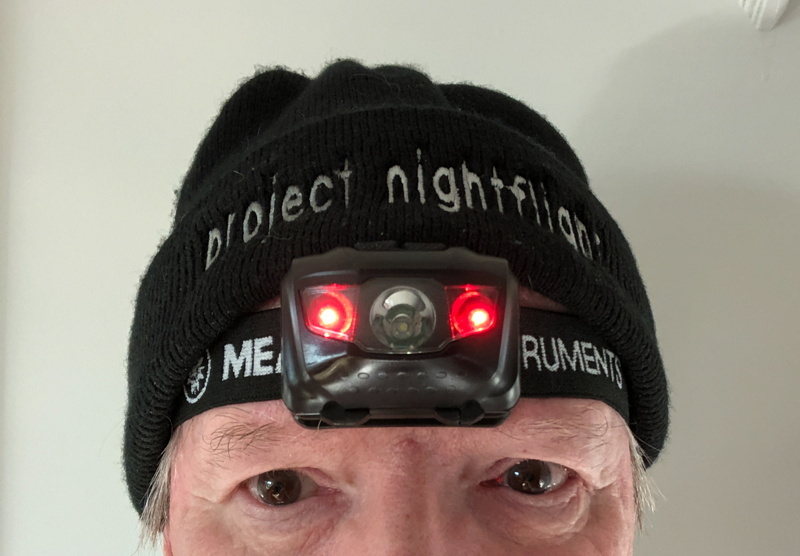 The white LED (bright or dim) can be used when you (and people near you) do not need to maintain eye dark adaptation and is useful when details need to seen when working on something. One night when I was at the observatory I was harassed by some Javelinas (wild pig, a protected species in Arizona). Using the bright white LED I could see them when they were quite a distance away from me. I did not use the light when they were close to me as I didn't want to spook them. 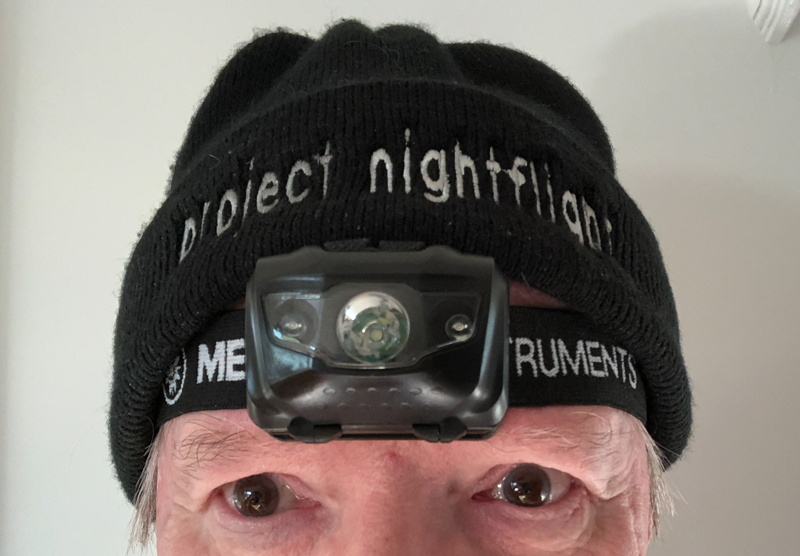 I have frequently seen other amateur astronomers at star parties using headlamps. I had never realized just how nice they can be until I experienced it using the Meade Headlamp. I do wish the red LED had a dim mode instead of the flashing mode (which seems odd for an astronomer's light). 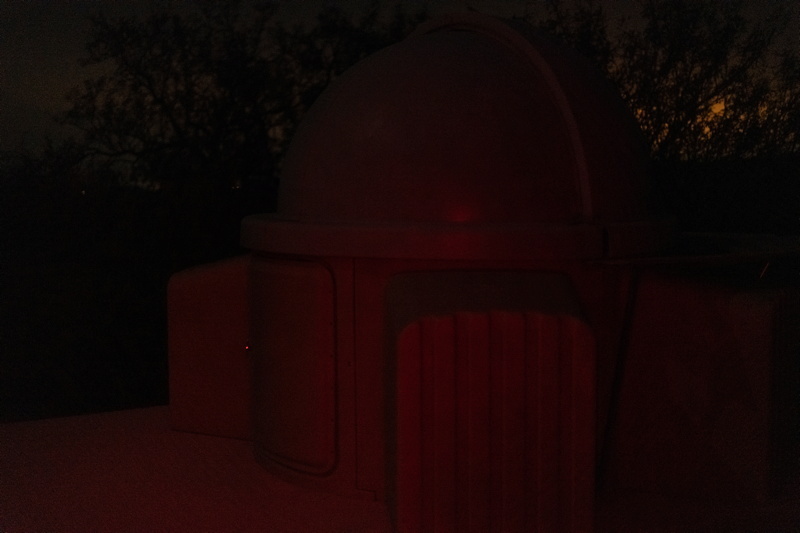 At my dark sky site the red LEDs are not too bright (so no need to place red lens tape over the LEDs), but having a dimmer red light at times would be nice. The Headlamp can also be used as a reading light, work light, or safety light during electrical power outages. 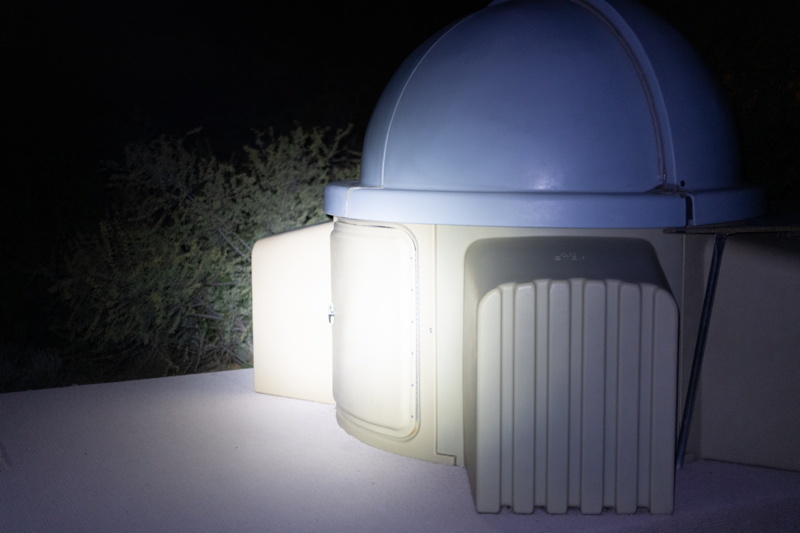 Don't think of this light for use just at the telescope. 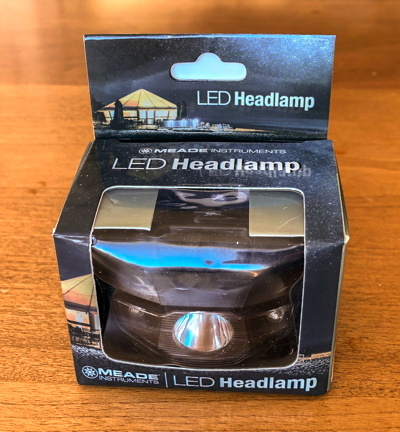 The Meade Headlamp is definitely priced right at $13 and mine will get a lot of use.